The third DLC map pack for Call of Duty: Black Ops II, dubbed “Vengeance,” is set for July 2, and here’s a trailer to tease your trigger finger. 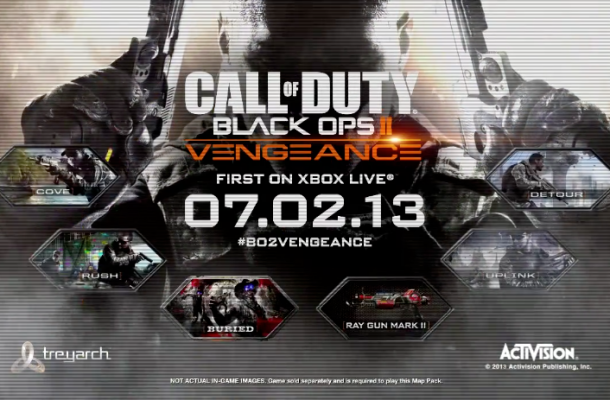 Vengeance, much like the previous DLC packs, will have four multiplayer maps and a new Zombies mode. Uplink is an updated version of the great Black Ops map Summit, Rush is a paintball course, Cove is a small island with multiple bottlenecks, and Detour takes place on a suspension bridge. The zombies mode will feature a little underground Western town and the Ray Gun Mark II, yet another in the line of bizarre weapons the the mode has featured so far in Black Ops II. As with the other packs, this will be a temporary exclusive on the Xbox 360 on July 2, with the PC and PS3 versions to come a bit later. Check out the trailer below. Are you still ready for more Black Ops 2, or are you ready to move on? Tell us in the comments, or visit us on our Facebook or Twitter!